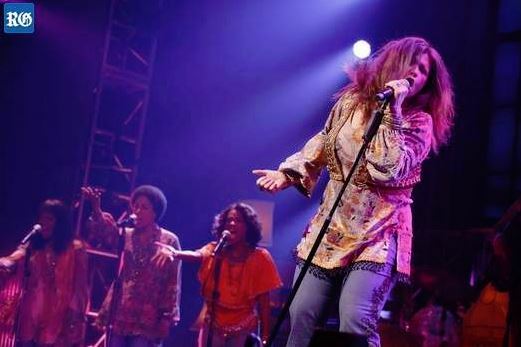 On song: Mary Bridget Davies brought the music of Janis Joplin to the Bermuda Festival (Photograph supplied). Heading on stage after a short intermission, Davies stuck with more of the blues/rock inspired Joplin songs parading out and delivering Joplin classics such as Cry Baby, Piece of My Heart and Me And Bobby McGeein all of their earthy, vibrant glory. I’m sure most of the audience who had seen and heard Janis Joplin before this iteration would disagree that any Joplin song would be considered “lesser known”, but this Joplin novice also enjoyed Davies’s interpretations of less well-known tracks including Turtle Blues and, in particular, Maybe. The latter really giving Davies a chance to tap into the emotional and gritty performances that Joplin will for ever be known for.